The Rev. 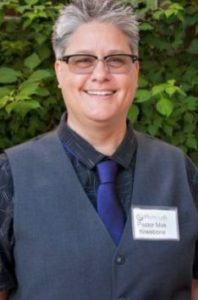 Mak Kneebone, pastor of Plymouth United Church in Spring, TX, is the Open and Affirming Coalition’s new president. Kneebone was elected by the Coalition’s Leadership Team at its meeting in July in Baltimore. Pastor Kneebone is the Coalition’s first transgender president, and the second transgender person to lead the Coalition’s board of directors. Barbara Satin, an early leader of the transgender movement in the UCC, was elected the Coalition’s moderator in 2002. Earning his M.Div. degree from Chicago Theological Seminary, Kneebone served as pastor for congregations in Chicago and Northern Indiana before his call to Texas last year. Besides Kneebone and Porter, the Coalition’s Leadership Team includes the Rev. Kevin Tindell of Chicago, vice president, the Rev. Rebecca Voelkel of Minneapolis, secretary, the Rev. Lesley Jones of Cincinnati, and the Rev. Mike Schuenemeyer of Cleveland.